Nintendo’s E3 presence started with a boom today, as the Super Smash Bros. series director made a handful of announcements ahead of the Nintendo Digital Event on Tuesday. New challenger & stage: Ryu & Suzaku from the Street Figher series – £5.39|$5.99|€5.99 for one platform, £6.29|$6.99|€6.99 for both Wii U & 3DS. New challenger: Roy from the Fire Emblem series – £3.59|$3.99|€3.99 for one platform, £4.49|$4.99|€4.99 for both Wii U & 3DS. New challenger: Lucas from the Mother series – £3.59|$3.99|€3.99 for one platform, £4.49|$4.99|€4.99 for both Wii U & 3DS. New costumes for Mii Fighter: Akira and Jacky from the Virtual Fighter series, Heihachi from the Tekken series, Isabelle from the Animal Crossing series, MegaMan.EXE from Mega Man Battle Network, ZERO from Mega Man X, Inkling Girl, Inkling Boy and Squid Hat from Splatoon – £0.69|$0.75|€0.79 each for one platform, £1.09|$1.15|€1.19 each for both Wii U & 3DS. £5.52|$6.00|€6.32 for all costumes on one platform, £8.72|$9.20|€9.52 for all costumes on both Wii U & 3DS. New stage: Dream Land – £1.79|$1.99|€1.99 for one platform, £2.69|$2.99|€2.99 for both Wii U & 3DS. New stage: Miiverse – FREE, only available on Wii U. If all of that takes your fancy, you can buy it as a bundle for £19.88|$21.96|€22.22 for one platform, or £26.68|$29.16|€29.48 for this content on both Wii U and 3DS. Similar to Mario Kart 8′s Mart Kart TV feature, you’ll soon be able to save and upload replays directly to YouTube. No date has been given, but this functionality will be coming exclusively to the Wii U version of Super Smash Bros. in the future. 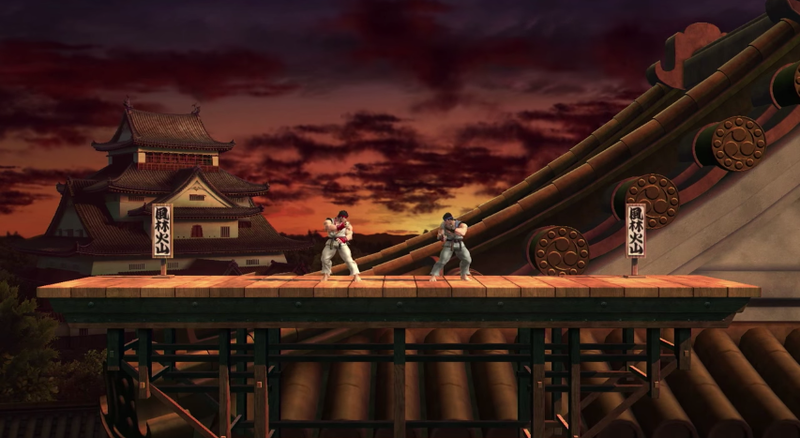 More specifically, Tourney Mode is set to arrive in another free update to Super Smash Bros. for Wii U in August. Development on this mode is completed, but Nintendo is delaying its release to iron out any issues with the online components. Good (or bad) news for the collectors out there. Nintendo’s confirmed that Ryu will eventually join Sonic, Mega Man and Pac-Man in the current line-up of third-party amiibo characters. Meanwhile, the next wave of Smash amiibo will launch in September, featuring Duck Hunt Duo, Mr. Game & Watch, Star Fox’s Falco, and a controversial R.O.B. -with a unique design between the Japanese and Western markets. Importers are gonna love that one! If you’d like to catch up on the presentation, find it below. If you can’t stand to see Sakurai’s complete amiibo collection, you should probably give this one a miss. This entry was posted in News, Out This Week and tagged Bandai Namco, Capcom, E3, E3 2015, Nintendo, Nintendo 3DS, Street Fighter, Super Smash Bros., Super Smash Bros. for Nintendo 3DS, Super Smash Bros. for Wii U, Wii U. Bookmark the permalink.